A close up picture of the unique sandstone formations on the Hoodoo Trails in Writing on Stone Provincial Park in Southern Alberta. 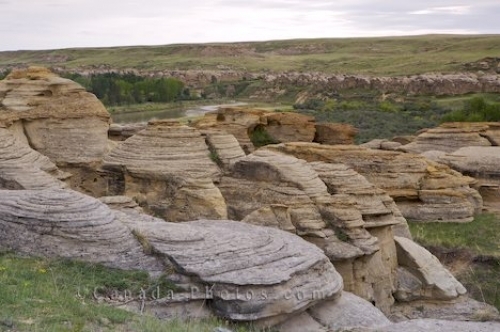 When hiking on the trails in Writing on Stone Provincial Park in Southern Alberta, Canada you will find many interesting sights but the most fascinating is the Hoodoos. A hoodoo is made up of sandstone that has been worn away over the years by rain, wind and snow and unique cliffs have since been formed. These hoodoos are extremely fragile and following the signs along the Hoodoo Interpretive Trails is of great importance. Hoodoos along the Hoodoos Interpretive Trail in Writing on Stone Provincial Park, Southern Alberta, Alberta, Canada. Picture of the sandstone formations across the landscape on the Hoodoo trails in Writing on Stone Provincial Park in Alberta.